berries, in that order. Photo: Annie Klodd. This summer, we conducted preliminary research on four Minnesota vineyards this summer that reported severe LBSN symptoms. Based on our results, it is more likely that LBSN in Minnesota is due to cool, wet conditions and vine management, rather than soil nutrient imbalances. Soil tests and foliar nutrient tests did not reveal any evidence of nutrient imbalances or deficiencies at any of the vineyards we studied. On the other hand, the locations of the vineyards did experience relatively cool, wet weather from 2016-18, when LBSN was reported. Read the full article here, on the UMN Grape Breeding and Enology blog. Identifying the cause of bunch stem necrosis is complex, and may require multiple field seasons in order to examine multiple factors and test management options. 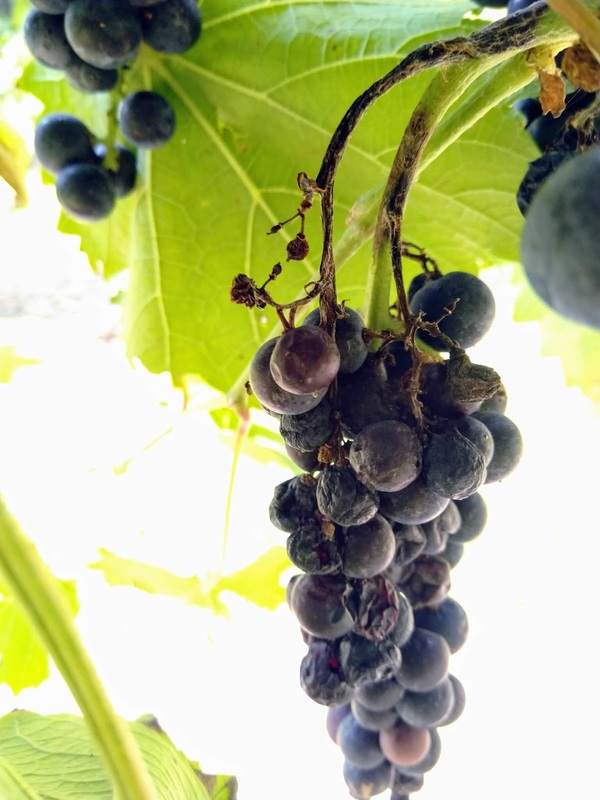 Pending funding, we hope to be able to provide recommendations for Minnesota grape growers.